I've been considering a Thermomix (or Thermie/Thermy) for 18 months or so now. I can't remember where I first saw it... I think it may have noticed them sitting (unused) on the benches on Professional Masterchef and then tried to find out what they were. The search resulted in me discovering a whole new world. The Thermimix community is enormous, especially in Australia. Owners tend to evangalise about their machines, with people claiming that their lives have been changed. Only a few voices said they'd bought one and regretted it. I was surprised at the price, especially given the guarantee was only 2 years. It was £880 or thereabouts in the UK. I had thought my Vitamix (at £400) was quite a lot of money to spend on a blender. Still, it wouldn't be the only expensive kitchen machine I had bought and I never buy expensive household equipment without being reasonably confident I'll get good use out of it. I've had relatively few failures (my Remoska was one) and quite a few that have been fantastic and I''d wished I'd bought them sooner. I was already a Vitamix owner, although I didn't make that much use of it. In terms of my successes/failures, I would put the Vitamix in the "success" category, but only just. It It was enough of a success that I didn't regret buying it, it was excellent at the things I used it for. I more regretted that I just couldn't get myself to do al the wonderful things that it could do. My husband (MH) didn't really like the soups from it. They were smooth, which he liked, but they always still tasted like they were uncooked. That's fine if you like raw veg, but not so great if you don't. In the year we had the Vitamix, MH did not use it once. Mind you, at that stage I don't think he'd ever used the food processor or the KitchenAid either, but they probably didn't add anything to his style of cooking whereas the Vitamix might have done. As soon as I read up about it, I started to save for a Thermomix. it wasn't that I couldn't have found the money to buy one then and there, it was just that I was concerned I'd buy it and then not get value out of it. In these cases, I find it helpful to walk away and leave it for a while, and see how I feel after a break. Saving up for it would take some time and, if I could fund most of it from pin-money, I wouldn't mind so much if it turned out to be a white elephant and had to be sold. Little pockets of money were squirrelled away: Quidco cashback, voucher spend (wherever I used, say, vouchers earned on my credit card or Boots Advantage Points for things I would be buying anyway, I put the money I "saved" into my Thermy pot. I added in Ebay sales whenever I had a clear out, and so on. Meanwhile,I asked my friends - both real life and friends on a forum I frequent - whether they had ever heard of it. None had. I watched a lot of YouTube demos. I thought about what I would use it for. I was realistic about what (if any) of my kitchen appliances it would really replace. Vitamix? Expectation: Yes, I can see it replacing my Vitamix. My expectation is that it will do what my Vitamix does (maybe differently), and more. Food Processor? Expectation: No. It doesn't slice, nor does it properly grate - it chops. I learned with the Vitamix (VM) that cheese grating etc is a lie, the VM just chops the cheese into smallish pieces. , I'm also not sure that the Thermie can make very small quantities of hollandaise sauce (I love Eggs Benedict). KitchenAid? Expectation: No. I can see that the Thermie can make batter type cakes, butI dont believe it'll make decent sponge cakes. I also use my KitchenAId to make butter (I convert 8-10litres of cream in one mammoth buttermaking session every few months). The VM was meant to be able to make butter. Well, yes, kind of, in small quantities, but you can't get it out of the damned jug. Bamix/Hand Blender Hmm, maybe. Although a stick blender is a handy thing to have. I guess I could sell the Bamix and buy a cheap hand blender instead. I have more kitchen appliances, maybe I'll talk about those later. The other reason for my hesitation in jumping in was that I was very aware that the current model had been launched back in 2004. I was concerned that that I'd buy the machine and then Vorwerk would bring out a new improved model. The second hand market would be flooded with used TM31s and I'd be regretting not wiating for the new improved machine. There were lots of things which supported this speculation: a new factory had been built, there was a lot of chatter on the various Thermomix websites and blogs. Over the next few weeks (maybe months, it's hard to remember), I kept going back to look into it, I just couldn't make up my mind. In the end, I decided I'd go to a public demo, onmy own, to see whether it actually lived up to the hype. If it did, I would tell MH about it, and arrange a demo at home. We live fairly close to Thermomix UK head office, and I wanted to go to a public demo there. They had demos fairly frequently, I just needed to find one which was happening at a time when MH wasn't around so that I didn't have to explain about it. It proved difficult to attend a demo "in secret". Eventually, I told MH that I was thinking of getting spending a small fortune on a piece of kitchen equipment which was kind of like an advanced Vitamix. Of course he pointed out that I didn't use the VM for much beyond chopping vegetables, making gravy, making hot chocolate and smoothies. I know him well enough to know that he was just trying to understand, so I sent him the links and told him that honestly I didn't know if it would be any good but I'd like to look. There weren't any Thermomix demos scheduled at head office, so I got on with other things, and checked back every so often to see whether dates had been added. Demonstrator demos were listed, but there weren't any Demonstrators near me. 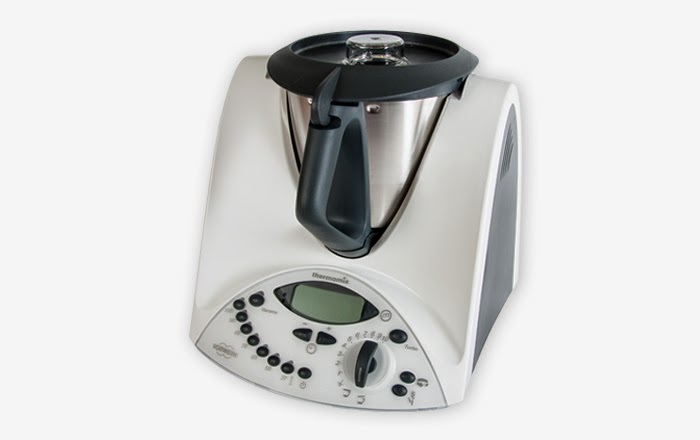 Then one of my forum friends, who had investigated Thermomix after my questions, mentioned that she had been to a demo and was so impressed that she had bought one. When it arrived, she was so enthusiastic about it, and it re-awoke my interest. There were still no demos at Head Office. I re-read up on Thermies, and decided to sell my Vitamix (VM) while it had plenty of guarantee left. If I bought a Thermie, I wouldn't need the VM. This also gave me the final amount of money I needed so that I could buy one anyway. After a long time, I emailed Head Office to ask when they would start scheduling demos again. They were no longer doing demos. I had to go through a Demonstrator. That was a bit of a setback. I didn't want to go and see a Demonstrator, not until I was in the buying groove. I searched through the list to find the locations of my nearest Demonstrators, and they were all more than 45 minutes drive away. Not a huge amount, but it was a bit of a nail in the coffin. I googled the three closest Demonstrators. One of them didn't really seem to have any info, two did. Hmm. Of the two, one had blts of info about Thermomix, she was obvously into it in a big way. She was based in Chiswick. That put me off a bit. I don't have anything against Chiswick, but it's a moneyed area, and I imagined that the demo would be full of yummy mummies and I'd just wouldn't fit in. In the end, the choice came down to the dates that were being offered. I bit the bullet. I picked a date. I emailed the Demonstrator to book a place. And that's when things started to go a bit wrong.